Thus, the first pair_of rotation angle measurements has correlated noise, whereas the second does not if the magnitudes of the noise for the Earth-in and Earth-out times are the same. The implication of Eq. (13-14) is that noise in the Sun sensor crossing time data affects both the and rotation angle models in the same manner. 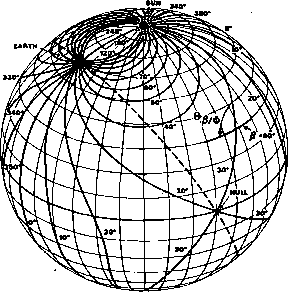 Because it is assumed in the use of many estimation algorithms that the random errors in the observations are unconelated, the Earth-width and Sun-to-midscan rotation angles are the preferable observation models. There are also guidelines concerning the number of observation models to employ for a particular application. There should be enough observation models to make use of all sensor measurements which would be helpful in estimating the elements of the state vector. Also, it is desirable that there be several different models based on the same sensor data so that the user can select the appropriate models for changing mission conditions. Different state vector elements may be more observable in different models and the changing geometry or sensor performance may require changing observation models. Finally, there should be some observation models which depend on a minimum of sensor measurements so that the loss of one or more measurements does not invalidate all observation models. Within these guidelines, the observation model vector should be as small as possible to minimize design and operating complexity. The largest number of independent observation models that can be used at any one time is the same as the number of independent measurements.